Metropolis (2010 restoration) | Anime etc. The granddaddy of silver-screen dystopias, Fritz Lang’s silent epic Metropolis returns to cinemas in a new version restoring twenty-five minutes lost for most of a century. That Metropolis is a colossus of cinema is beyond question. How exciting the new footage is may depend on your level of cinephilia. 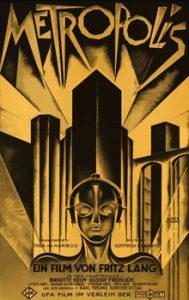 Metropolis plays less like SF than a good-versus-evil fairy-tale about a revolution of the oppressed masses in the towering, tyrannical supercity of the title. The hero is the dictator’s histrionic son, but Brigitte Helm is the true star in her double role as the two Marias. One Maria is a saintly revolutionary matriarch. The other is an evil robot Whore of Babylon who twitches, winks and leers, driving men wild with her whirling gyrations. Be warned that the bad-girl Maria appears only fleetingly in metal form (as she’s often shown in picture books), though her human disguise is striking enough. The restored footage is generally in a far more damaged state than the otherwise splendid print, though this actually makes the viewing experience more engaging. Much of the restored material consists of shots of a few seconds each in the midst of longer scenes, scattered all through the film. However, the climax is bulked up considerably, especially a Titanic-style sequence where the heroes struggle to save hordes of kids from a rising flood. The restored scenes also intensify the relationship between the city’s ruler and the mad bad inventor-sorcerer Rotwang, played with livewire, black-gloved intensity by Rudolf Klein-Rogge. (If only he could have played Frankenstein!) However, it’s also clear that some scenes are still lost, including a fight between the two men, so the search for a definitive Metropolis goes on. 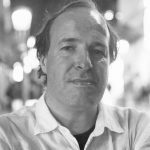 Fittingly, the lost footage was discovered in a film museum – the Museo del Cine in Buenos Aires. A full list of the restored scenes is available on the film’s official website.